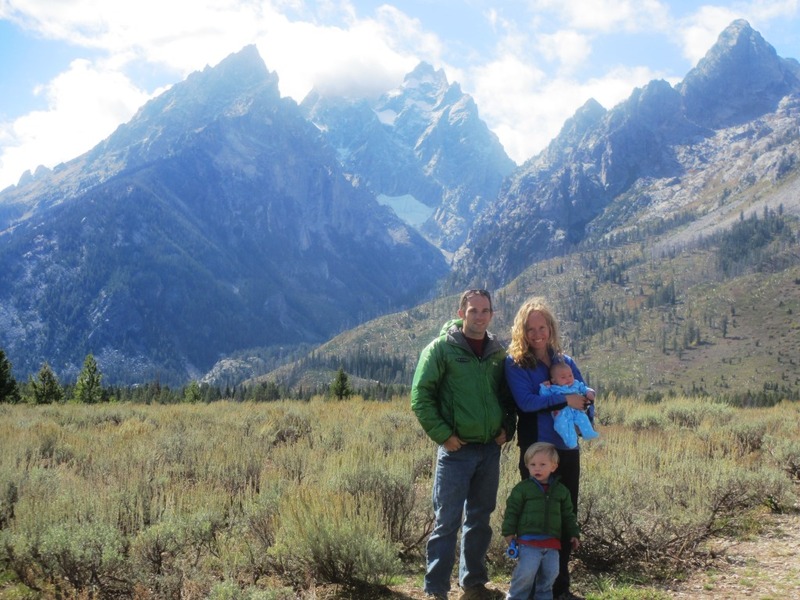 We recently spent a few days in Wyoming to take advantage of the last week of Kate’s maternity leave. Sinks and Wild Iris are among our favorite crags. I can’t ever recall having a bad day at Wild Iris. Even when I get bouted by a project there (which happens often enough), the warmup climbs are so fun and the setting so magnificent its hard to leave the crag without a smile. The weather on our trip turned out to be a bit schizophrenic, varying from highs in the 80’s to snow and a high of 40 only a few days later. 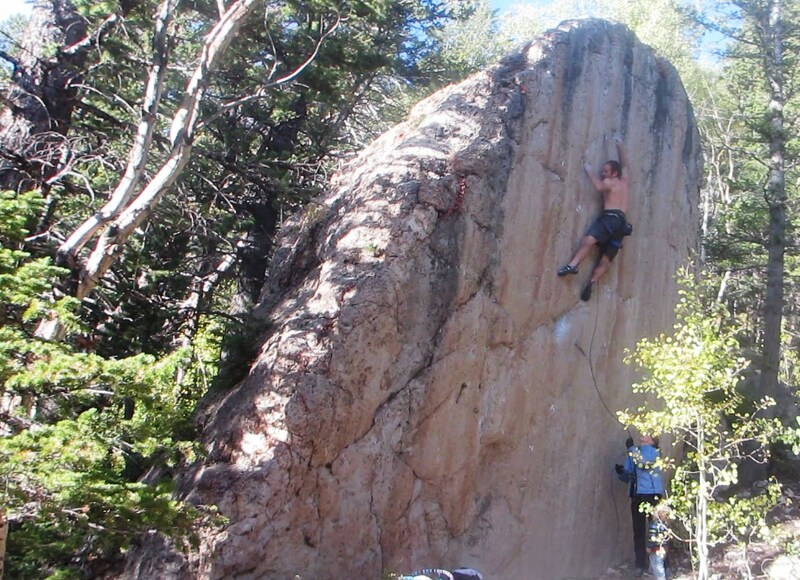 This kept us bouncing from crag to crag in search of bearable conditions, but we were able to spend a gorgeous day at Wild Iris and a few at Sinks Canyon. This was our first serious climbing trip with two kids, so we weren’t sure how things would go. We started at the Killer Cave, and I managed to climb a number of great routes, including a pair of classic 5.13s. I attempted an onsight of The Urchin, a short, gymnastic roof climb right at the top of the approach trail. I fumbled the roof sequence, which was probably a blessing because I doubt I could have kept it together on the tricky finishing slab. I also sent Virga, a super fun, super reachy .13c or d (d in my experience, at 5’7″). Quite a fine effort back in the day by the frequently underestimated Paul Piana. Virga climbs some of the best limestone I’ve seen in America, but it only lasts for about 20 feet, and the winch start is literally as long as the route itself. Still, the climbing is super fun and definitely worth doing if you like dynamic pulls between sinker two-finger pockets. Pretty much every move on the route is burly, but the moves are so big that its over in a flash. One of the big moves on Virga, locking-off a sidepull nearly to my knee! After a couple of days dragging 60 pounds of Logan-plus-climbing-gear up the steep slog to the Killer Cave, I wanted convenience. I’ve climbed quite a bit at Wild Iris, but I had never been to the OK Corral, which is located almost on top of the car-camping area. 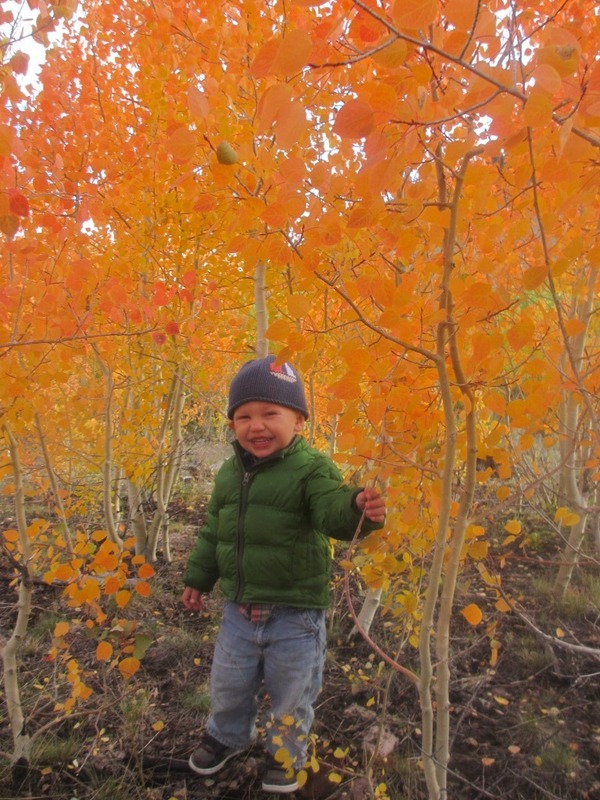 The cliff is about 100-feet from the road, making it the perfect choice for weary parents. I had heard that the rock at the OK Corral wasn’t as good as that at the rest of the Iris. 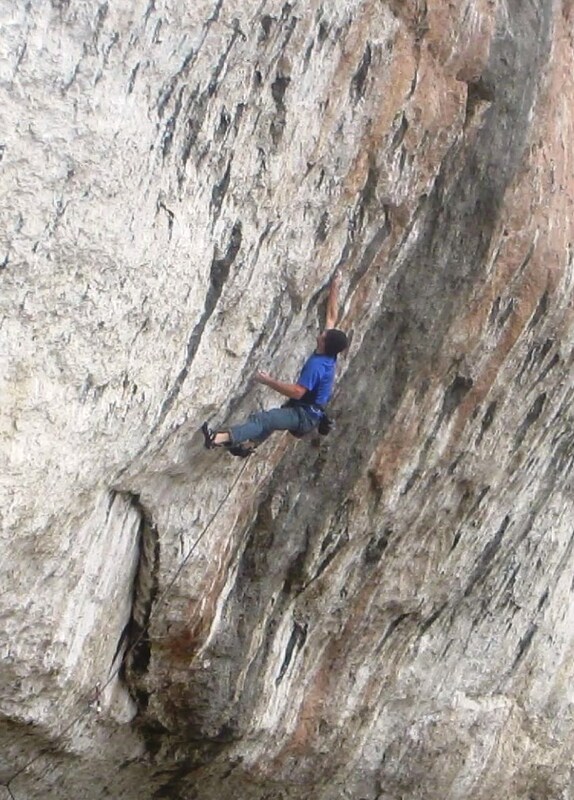 I couldn’t tell; it was way better than any other limestone I’ve climbed in the last year! I set out with two goals for the day, first to tick ten routes, a major challenge with kids in tow, and second, to try to send the elusive “White Buffalo”, an enourmous boulder with a 3-bolt mini-route on its Southeast face. 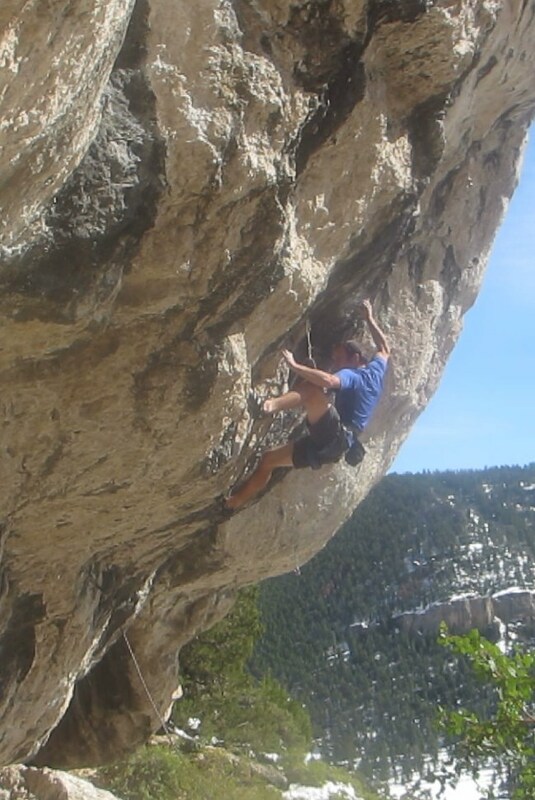 The route is given 5.13d/V11, which is a good indication of the way things are graded at Wild Iris. At any given grade you should expect to have to crank much harder moves than you usually would. This is presumably because the routes are often quite short, but I think it’s as much an indication of the quality of climbers that have graced the Lander community through the years. Based on the forecast it seemed unlikely I would get another day at Wild Iris, so I would have to give it my best shot to send the line that day. I took my time getting warmed up, climbing a number of really fun but never trivial warmups. White Buffalo gets sun most of the day, so I kept running between the main wall and the boulder to check the shade status. It seemed like the sun was hardly moving at all, so I kept dragging out my warmup waiting for shade. 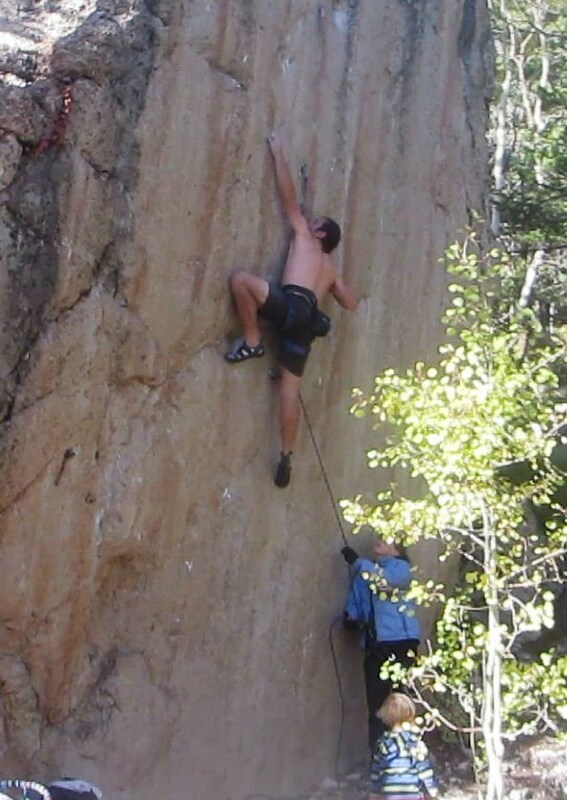 My final warmup climb was a brilliant “12a” buttress called “Give My Love to Rose”. It had quite a burly mono crank on it, and to be honest it felt like about a 12c effort to get up the thing onsight…so its probably soft by Wild Iris standards! Around 4pm White Buffalo finally went into the shade, so I jumped on it. The route overhangs maybe 5 or 10 degrees, and follows tiny imperfections up an otherwise impeccable wall. The stone is so smooth it looks more like the polished quartzite of Arapiles than Bighorn Dolomite. The route starts out easily, but quickly gets down to business with a huge rock-over move to a diagonal, left-hand 1/4″ crimp. The crux is standing up with this left hand and moving to a pad-and-a-half-deep four-finger pocket. Its possible to reach this pocket with either hand, either with a huge windmill move with the right hand, or by using a half-pad mono sidepull for the right hand and then bumping the left hand to the pocket. I experimented with both options for a while but couldn’t manage either. After 15 minutes or so I moved on to the upper panel. Relative to the crux, the finish is not too bad, but none of the holds are positive and the feet are small, so each move feels desparate and inscure. From the 4-finger pocket, a slopy, 1-pad edge allows a clip, then a a pair of 3 finger pockets and a big high-step lead to a committing huck to the lip of the boulder. I was a bit demoralized, having failed to do the crux move at all on my first go, but with the sun beginning to set conditions were improving rapidly. I rested for 45-minutes, trying to cool off my skin, and debating which hand sequence I should use at the crux. Heading up a route without a clear plan leads to hesitation, and on routes like this, hesitation almost always results in failure. Certain routes, like White Buffalo, are best climbed with momentum, barreling onward, leaving the climber no time to contemplate his unlikely position, clinging spider-like to a sheet of glass. The windmill beta was less tenuous, but low percentage. I commited to trying the mono beta and tied on for my second go. The natives were getting restless for dinner, so it was doubtful I would get a third try. 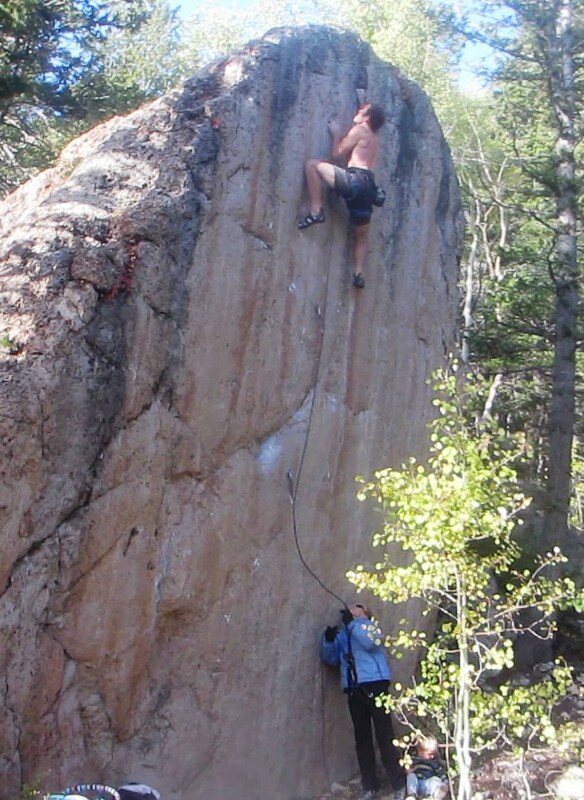 I climbed smoothly up to the rock-over move, and latched the left-hand crimp. The rock was much cooler and the tiny edge now felt much better. I carefully stood up, shifted my hips slightly to the left, and delicately placed my finger into the mono sidepull. I popped my left hand to the four-finger pocket and exhaled. After a quick dab of chalk, I reached the sloping edge, clipped, and clawed my way to the high pockets. I brought up my feet, gunned for the lip, and mantled over the top of the boulder. ← Get ’em While They’re Hot! Nice job, Mark. I’ve had Wild Iris on my long list of climbing destinations; this post may have just moved it to my short list! Over the past week I’ve noticed someone that looks like the guy in these photos at Indy Pass with family in tow. Was that you perchance?